Eureka, back to spoilage yeasts. 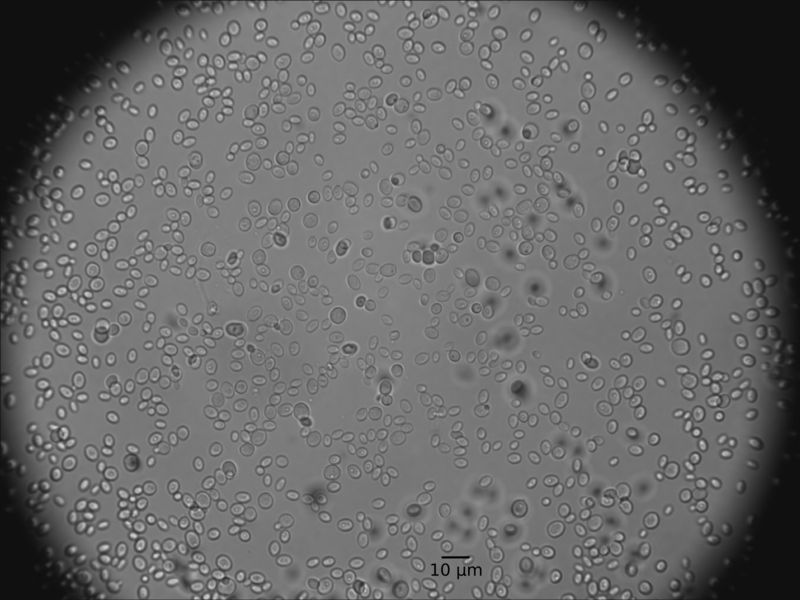 Today, I would like to introduce another spoilage yeast called Metschnikowia pulcherrima (anamorph Candida pulcherrima): A killer yeast with applications in the wine industry, available at Lallemand’s (aka Flavia MP346) and results from one of my countless (beer) split batch experiments. I hope there is something in here for everyone. Put on your science hats, take out your pencils & notepads and start reading. Spoiler alert: you have to interpret the results yourself. M. pulcherrima can be isolated from grapes, cherries, Drosophila spp. (fruit fly), flowers and spoiled fruits [Kurtzman et al, 2011]. A yeast commonly found in nature then. If you want to know more about M. pulcherrima and its role in the wine production, go to http://wineserver.ucdavis.edu. I could not find a source where M. pulcherrima is linked to beer or discussed as potential spoilage yeast thereof. This might not be that surprising since beer is, first of all, commonly not brewed with fruits and second, it’s not really the most alcohol resistant nor metabolically advanced yeast in the universe. Apparently, M. pulcherrima seems to have an alcohol tolerance of about 5% [wineserver.ucdavis.edu, 2015]. Not really high compared to brewer’s yeast with levels of around 12% (or even higher). What is so special about me? 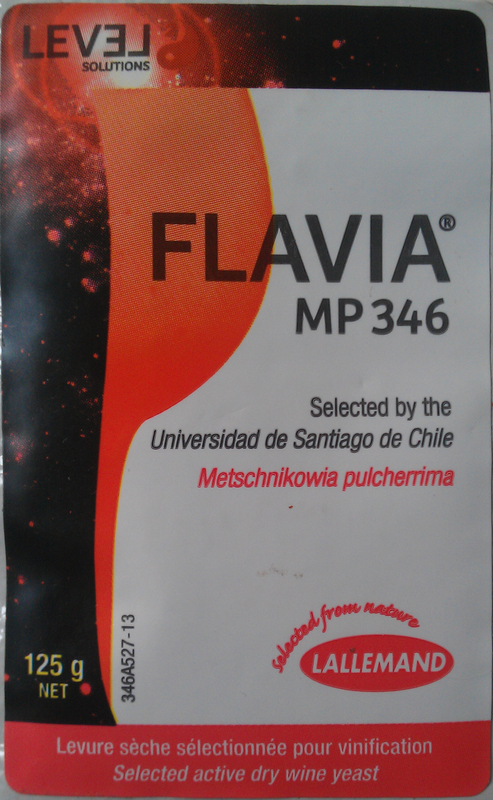 As mentioned in the introduction, Lallemand sells a M. pulcherrima product called Flavia MP346. One of the few advantages to brew in Switzerland is the fact, that everything around me is about wine. And getting wine yeasts is therefore rather easy. I therefore got myself a package of said yeast and tried to investigate the impact on beer. According to Lallemand, Flavia MP346 is a strain isolated from Chile with the speciality of α-arabinofuranosidase secretion to increase terpenes and volatile thiols to enhance the aroma of a wine. Overall increasing the aroma complexity (mainly fruit components) in the finished product. The yeast is commonly added to the must first followed by a Saccharomyces pitch 24 h later on. To test if there is any (detectable) effect on aroma complexity in a malt based beverage like beer, I performed a simple split batch experiment. I started with a straight forward Belgian inspired recipe (3 kg Vienna malt, 3 kg Abbey malt and 0.5 kg CaraMunich 2; 24 IBU with Saazer; OG about 1.066, brewed 12. December 2014), and split the wort in two parts. One part fermented with a Saccharomyces (US-05) only, the second part with a dose of M. pulcherrima for 24 h before pitching the same Saccharomyces strain. I was really curious to try this yeast because an effect seemed very unlikely to me since the yeast can mainly ferment glucose (see below) and is incapable of fermenting maltose. Not to forget the rather low alcohol tolerance. Bottled on 12th of January 2015 (TG_control: 1.023 (5.9 ABV), TG_Metschnikowia: 1.024 (5.9 ABV)). Aroma: Lots of dark fruits like figs, prunes. Caramel notes as well as burnt sugar components. Very nice! Appearance: Red-brown color, slightly cloudy, off-white head (see picture on the left). Lots of carbonation. Flavor: Very similar to aroma. Caramel and malts. Not much else going on (yeast character or whatever). Mouthfeel: Light body, average carbonation, malty/sweet-caramel/bitter finish. Very nicely balanced. Overall Impression: Nice bitter:body balance. Very classical and easy to drink. Most of the character originates from choice of malts (caramalts). Not much flavor picked up from US-05 yeast (as planned). Aroma: Different (compared to control): Besides the malt character (caramel, dark fruits, burnt sugar) notes of raspberries, pepper and wild funk (mostly phenolic acids). Very pleasant aroma profile. Appearance: Red-brown color, slightly cloudy, off-white head (see picture on the left). Lots of carbonation. Similar to control. Flavor: Similar to aroma without the fruity components (mainly caramel & malt). Finishes with a bitter overhang (balance toward bitter). Overall Impression: Typical Belgian dark ale with hints of fruits as well as phenolic funk in the nose. Body on the lower end resulting in an overhang of bitterness (not very well-balanced). 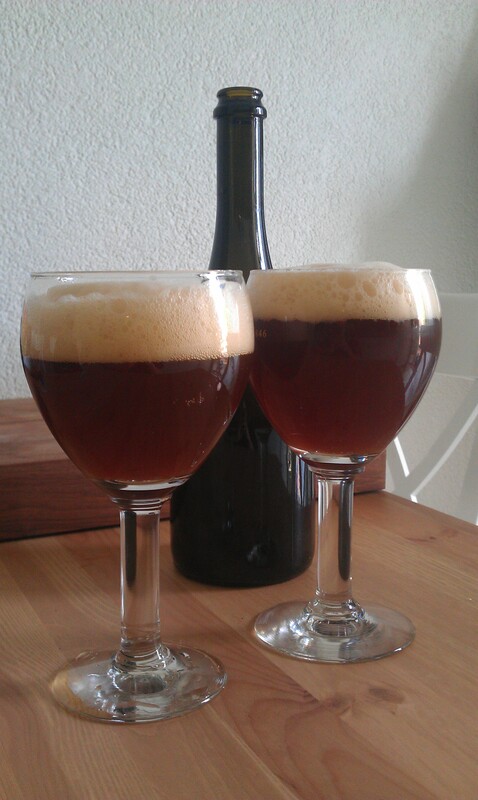 Seems to have attenuated more than the control resulting in a low body and over-carbonated beer. In the end, I prefer the control. Although the aroma profile of the Metschnikowia beer is nice, it’s a less drinkable beer (my opinion). So far for the plain results. Lets put them into perspective. According to Lallemand, the yeast is used in wine to promote the fruit components. And I have the feeling that I was able to pick up such an effect in my experiment as well. The beer dosed with M. pulcherrima had pronounced notes of fruits which were not present in the control. The beer had a higher attenuation level resulting in a lower body and a bitter balanced beer. Great! I will leave the interpretation of the experiment as well as other applications of this yeast to you. The only thing that I don’t recommend is to ferment a beer with M. pulcherrima only. Simply because of its incapability to ferment the most abundant sugars in wort (just in case someone tries that, goes horribly wrong and wants to sue me for that). 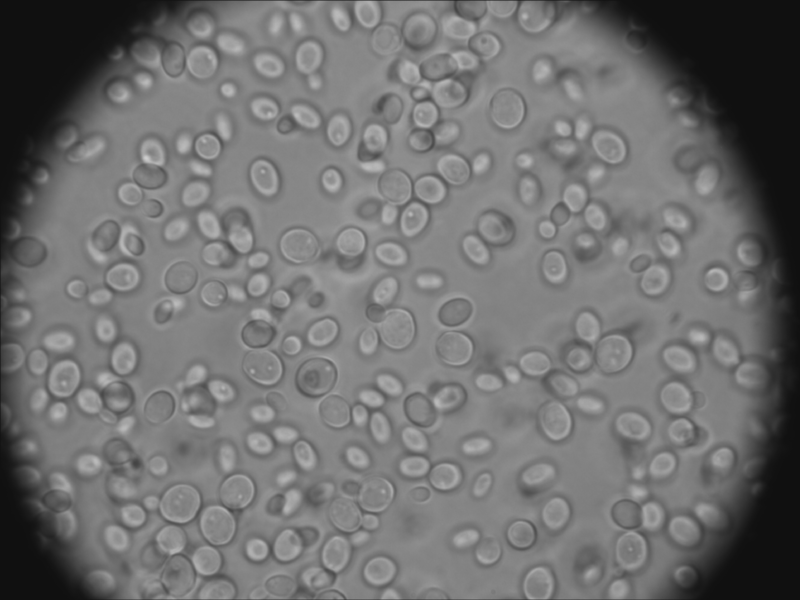 Yeast grows on Sabouraud agar like any other Saccharomyces yeast. I however noticed one difference: M. pulcherrima seems to be non-cycloheximide resistant (according to http://wineserver.ucdavis.edu, 2015). I plated the Lallemand product on Sabouraud agar supplemented with + 10 mg L-1 cycloheximide and I could not detect any colonies. Now some stats summarized from Kurtzman et al (2011). This entry was posted in Technique and tagged Technique, Yeast, Yeast basic by eurekabrewing. Bookmark the permalink. Very nice post, I would love to try this yeast in my sour beer and see what it gives me, but I cant seem to find anyone who sells it here in Sweden, do you know if there’s a shop in Switzerland who ships to Sweden? Great post! Interesting that the experimental yeast seemed much drier (or thinner, I guess) than the control. Of course, maybe it doesn’t produce glycerol, which would leave a thinner mouthfeel. Cheers Derek. No idea why the Metschnikowia seemed much drier here. So what is the purpose of α-arabinofuranosidase secretion? Is it similar to the other glucosidase enzymes like Scott Labs Scottzyme BG, Lallzyme BETA , and DSM Oenobrands Rapidase AR 2000? My thinking here is that you are not getting a big difference or preferable difference because you don’t have the right precursors. Why not try in a beer with plant matter that contain glucosides? The most obvious is hops, but other fruits contain them as well. We are starting to work on this angle, but I’d like your opinion based on the science side. I just grew up a culture of this from a colony, I’m looking forward to trying it out. Hello, what an awesome experiment! Do you continue brewing with this yeast? I have a qustion abou M. pulchermia – what is its preffered temperature for fermentation? I try to make sourcherry wine and I read there is this yeast on their skin and I hope for it to start the process. I couldn’t find answer to this question everywhere, that’s why I came to ask it to you. > Do you continue brewing with this yeast? I suppose around room temperature (or even a bit higher) should work quite well. Hi where can I buy M. pulchermia in bulk for yeast oil production? Thank you for your contribution to science! I found this yeast here in Ames Iowa USA by isolating it and sequencing its genome. Your article greatly helped my report on Metschnikowia pulcherrima.